Design/ SKU/ Ready Stock to generate quotation with RFID/BARCODE full flexibility to change Metal Price/ Stone/Labor, Catalogue, Daybook. Flexible Order generation, Priority ranking to follow-up production, Watch Control on shipment Date, Projected Raw Material Requirement, Order Status ( Commercial / Production), Ageing on shipment Date, Profitability on Order/ SKU/Customer wise, Budget Costing. Core planning for Requirement of raw material with projection, ABC analysis on Inventory Movement, Re-Order & Min Stock level ( Metal, Finding, Mounting, Stone), Auto PO for short Fall Inventory with Budget Estimation. Highest/ Lowest Price of Raw material to analysis the best vendor. Quantity & Amount Volume Analysis. Lead time analysis for Raw Material and Vendor. JOB Order, Process Mapping, In-House Indent, JOB Material Requirement, Job Bagging, Short Fall raw material analysis, Full Control on requirement follow up, Job History, Mirror view on Inventory Movement Control. Raw Material Schedule. Outsource purchase Order with Vendor reference, Raw Material analysis on outsource worker and vendor, Vendor labor analysis. Vendor Lead time analysis. Flexible process Stages, Precise control on Casting/ Waxing, Flexible repairing module, rejection analysis with comment, Worker analysis, BIRD EYE�s view on Production, WIP Floor Plan, Ageing on Production JOB due date, Process and Worker Performance, Loss Control, Production Valuation, Quality Control, JOB Costing, Splitting & Merging JOB PCS, Daybook ( Issue & Receive) JOB Bag, JOB History, Traffic Priority, JOB Costing Loss with Worker Analysis( JOB/ Worker/ Process), Factory Capacity Monitoring, Notification. Metal / Stone/ Finding/ Mounting/ Ready Jewelry Stock Accounting standard for Stock Card Analysis, Purchase Approval, Valuation, Stock Transfer, Physical Stock, Metal & Stone Adjustment, Issue & Return Material from Production, Sub Contract Metal & Stone Accounting, Metal Graining (Conversion), Worker Metal & Stone Loss Accounting, Metal Loss Register, Metal & Stone Summary for various level. 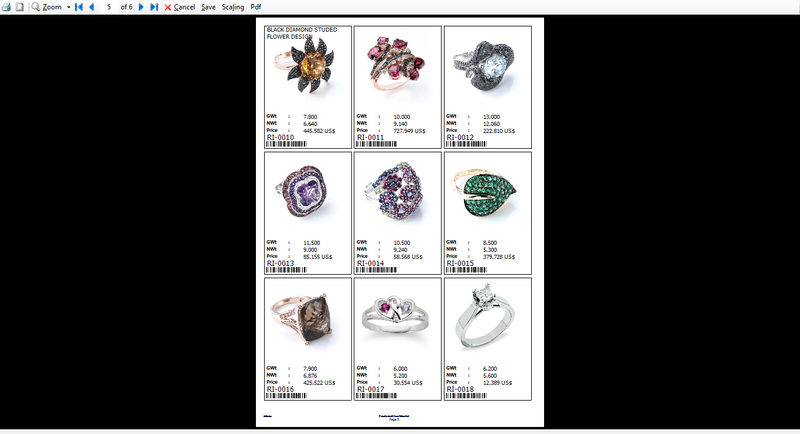 Metal / Stone/ Ready Jewelry Stock , Performa/ Consignment Sale, Sale analysis on SKU/ Customer profitability, SKU Marketing Analysis. Flexible alignment of Tag Fields for Ready stock, Inventory Label, RFID for Ready stock and Production JOB Bag & Process Sheet, Packing Label, Barcode & Sticker for Invoice, Quick Quotation and Order confirmation, Stock Reconciliation. Transaction, Outstanding (Receivable& Payable), GST Analysis, Forex Gain & Loss Accounting, Cash & Bank Book, Bank Reconciliation, Confirmation of Accounts, Reminder Letter. Trail Balance, Profit & Loss A/c, Balance Sheet, Scenario Management, Budget & Control, Cash Flow Projection, Work in Progress Valuation. Order Schedule, JOB Order Schedule, JOB Bag Schedule, Process& SKU wise Metal loss Analysis, Production Labor Analysis, Factory Capacity Analysis, User Rights, Log File. E-Commerce & Mobile app data synchronization, Exhibition Data integration, Cloud reporting, RFID & Barcode Integration. Tiara ERP Application compatible on WIN XP, Pro, Win 7, Win8, Win 10, Win 2008, Win 2012. Tiara ERP DATABASE compatible on MS SQL 2005, 2008, 2012 with Frame work 4.0 version and above. Tiara ERP application design on .NET, C++ with Own proprietary Control for Form Frame Work, Reporting Tool.